In the meantime, here is the largest painting I did for the exhibition, “Big Sky Farm”. 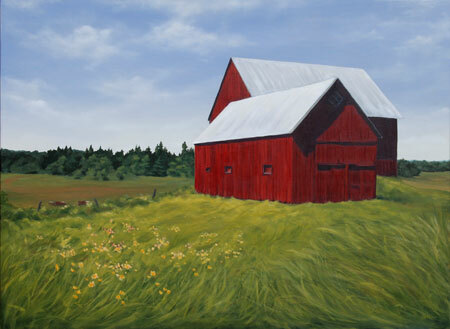 This is a gorgeous red barn that has been around since the late 19th century and, today, is used for sheep. Strangely, it was cattle that I saw the day I went to visit for this painting. Came to Gravenhurst on Monday, but the gallery door was closed so figured they were not open for a visit. Made another trip later in the week and it was well worth it. Just loved your work. There is nothing like seeing the original paintings. Wish I could afford to buy one. Sorry, I didn’t get to meet you. Maybe at your next show. Lana – I am hoping to get some pictures to add to the stories later this week… and then a painting! Kim – the trouble with taking such a large painting and making it small is the loss of my cows! They look like blobs here… LOL! Hi martin – I am glad you got to see the show! Kinsey – Don’t look at me – that’s what the owners call it and the view is incredible…. Wonderful piece, Michelle!! Can’t wait for more stories! Great painting…the sky looks so soft,with the green and red! !